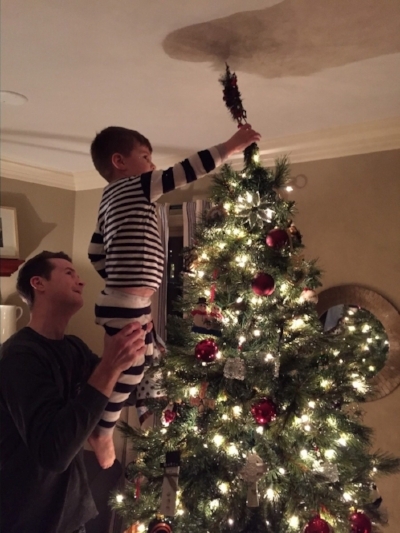 In the weeks leading up to Christmas, I'll be hosting a series of posts and guest posts, as my friends and I share what the holidays look like for our families. The first post is on CHEER - the joyful feeling that sweeps us up each holiday season, rooted in the celebration of Christ's birth and in time spent with loved ones. While advent doesn't start for a few more days, some of us have started our advent season plans. There's no right or wrong place to sit on the "planning continuum." I'm somewhat coordinated and intentional in my advent plans and over the years have borrowed fabulous ideas from friends, including my sister Betsy Callaghan, one of the best planners I know. Meet Betsy and her gorgeous family... my family! Betsy's approach to advent is so thoughtful. Over the years, some of her friends have even started asking to see her advent calendar, to get ideas for jump starting their own family plans. In the spirit of sharing cheer, here's a beautiful idea-filled post from my beautiful sister! Many of my childhood friends ate a delicious chocolate from an advent calendar each day leading up to Christmas. Not at my house. My daily countdown to Christmas was so.much.better! My mom created the most highly anticipated advent calendar. She would hang it up every November 30th. It dangled in the kitchen from a hanging shelf. Upon it were 25 little rings, each representing the days leading up to Christmas Day. On each ring hung a hand-written note that mom had Scotch-taped tightly shut, so that her sneaky little girls could not look ahead. There was a rotation in place for each day, which determined who got to open up the note. Haley, Anitra, Betsy, Haley, Anitra, Betsy, etc. On my morning, I would race into the kitchen to open the note and leave it on the counter for all to read as they woke that day. After leaving home for college, there were years when the advent calendar was lost on me. I thought about it often and missed it. I knew one day, when I had a family of my own, I would bring it back and create that same excitement. In December of 2007, after my first year of marriage, I created my own "husband and wife advent" for Dan and me. It was so much fun, and while it included lots of holiday cheer, my heart was waiting for an advent to share with children. I could hardly wait to see twinkling eyes, anticipation, joy and wonder that would surely come from sharing this tradition with kids of my own. We have now had our own Callaghan family advent calendar in our home for 10 years. I would love to share my planning process with you! The look of my advent calendar has evolved throughout the years and I finally have one that meets the design and function that I had hoped for. I created 25 red cards made from card stock and used a pretty font (and a good 'ole Sharpie) to draw the numbers 1-25 on each card. 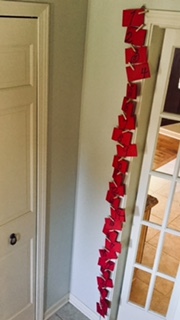 Each card hangs from a long piece of twine in the entry to my kitchen. I use small wooden clothes pins to attach each red card to the twine. Each day in December, we unclip a number and read what's inside, until eventually there are no cards left. Each November, I sit at the kitchen table with a blank December calendar and map out our activities for the upcoming month. I create my "master calendar," if you will. I was very creative the first two years and had to change activities to meet the needs of my growing boy to make sure they were age appropriate. 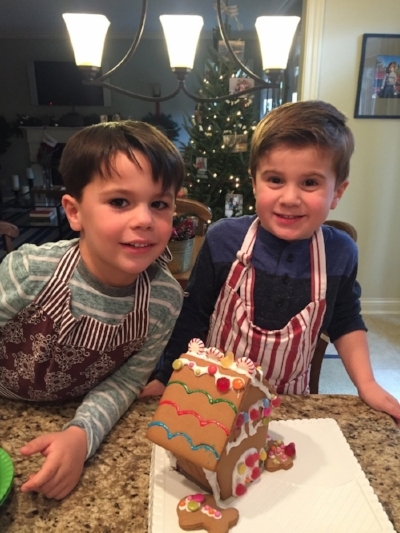 As the years have passed, we have a collected a bunch of favorites that are our go-to Christmas activities, and I try to add and change a few activities each year to keep it fresh, fun and exciting. About two years ago, I decided that while our advent calendar achieved the anticipation and wonder that I had dreamed of, it was missing something. HELLO??? How about the CHRISTMAS STORY!? I researched and found verses about the story of Jesus's birth for each day of advent. 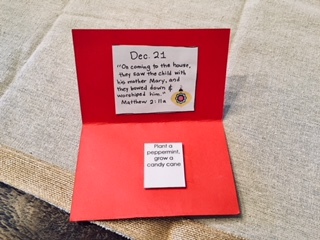 Now, when we open the red advent card of the day, we first read the Bible verse, then read on to see how we will spending the day. Next, I needed to add some depth and love to some of our activities. Did I want my child/children to be selfish as they anxiously await Christmas? Of course not! I want them to complete activities that make their hearts feel the love that Christmas brings, and I want to them to share that love with others. Last year I added a few activities that helped us show Jesus' love through our actions. Choose three toys to donate to a day care center. Take the toys to the day care and physically give them to the children. My son LOVES this and the children were soooo excited to have new toys to play with. Buy someone in Starbucks a coffee and wish them a Merry Christmas. Make homemade Christmas cards for neighbors and invite them to Christmas Eve service. If all of this is overwhelming, please don't be discouraged. You can start small. It will get easier as the years progress. Also, know that at least 10 of our 25 activities are simple and are consistent every year. Everyday doesn't have to be a show-stopper. Elf on a Shelf returns to our house for the season... now go find him! There will be years when circumstances require you to keep it really simple, and other years when you can add in some more exciting and memorable experiences for your family. Whatever direction you take a personalized advent calendar, one thing will remain the same... you will bring an extra layer of love, joy, and cheer to the holiday season for those you love the most. Thanks you, Betsy! I'll be busy in the following days getting my plans in order, with a few tips from you incorporated... for sure!